5 Songs From The Zenith Of Turkish Progressive Rock Peers of Baris Manco made innovative Turkish rock in the 1970s, but none released such a wide variety of music or became so celebrated in the decades that followed. NPR Music's globetrotting crate-digger spins a few psychedelic favorites from Turkey. The fruits of Egon's worldwide crate-digging: Rare funk, soul, psychedelia and hip-hop. 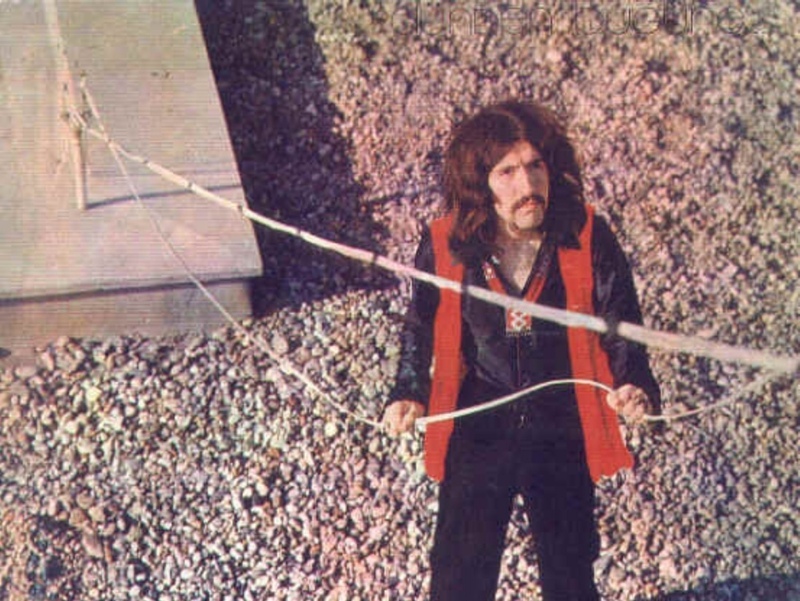 Barış Manço, from the cover of his album Dunden Bugune. My love affair with Turkish psychedelic pop and funky progressive rock developed over time. 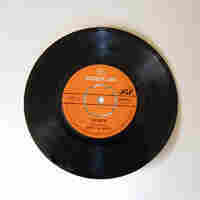 First came the chance discovery of a Turkish television music-library record sitting in a New York music store's basement. "Not for sale," the owner said with a laugh as he played me some of the most vicious jazz-rock I'd ever heard. (Later, I confirmed that the "Nathan Davis" listed on the record's label was indeed the Pittsburgh-based saxophonist, which further intrigued me.) Then came the whispers of hip-hop producer J. Dilla sampling the Turkish jam-rock heroes in Moğollar. 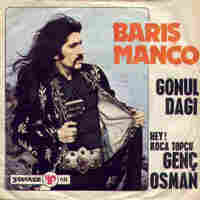 But I'll never forget the feeling that swept over me as I grasped the cover of the mustachioed maestro Barış Manço's "Gonul Dagi" seven-inch and listened to some of the deepest, funkiest music to ever grace a record's grooves. Its sonic quality reminded me of a mid-'70s David Axelrod production. Its melodies, filtered from the Anatolian countryside into Istanbul over centuries, sounded perfectly at home when played on a Moog synthesizer. 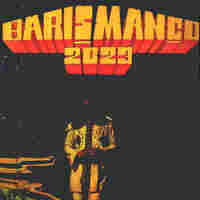 Manço's passable tenor invited comparison to French icon Serge Gainsbourg, while his Ottoman ensemble — pictured on the single's picture sleeve — suggested a flair for the outrageous. Enveloped by the sublime feeling of standing on the edge of a precipice and deciding to jump or meekly back away, I threw myself into Manço's career with abandon. Spanning nearly four decades, Manço's oeuvre could compel a record collector to purchase a one-way ticket to Ankara in the hopes of uncovering rarities like his Dünden Bugüne, a white whale of a Turkish psych album if ever there was one. Many of Manço's peers — Erkin Koray, Edip Akbayram, Ozdemir Erdogan, Cem Karaca and Ersen Dinletin among them — were Turkish rock innovators in the '70s. But they didn't release such a wide variety of music, nor have they been so celebrated by their own (and other) cultures in the decades since. This sampling below — taken from the early- to mid-'70s portion of Manço's career, when he was most clearly under the spell of psychedelic and progressive rock — helps demonstrate his genius. Egon is the general manager of the Stones Throw label. He also founded Now-Again Records, which reissues American funk and soul albums, and the Soul-Cal imprint with Peanut Butter Wolf. He DJs funk and psychedelia sets at venues all around the world. 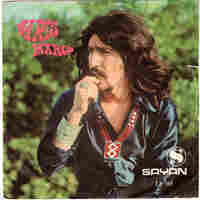 One of two seven-inch singles that Manço recorded with Moğollar for the Sayan label, "Iste Hendek Iste Deve" found its way onto the compilation album Dünden Bugüne, issued in 1971 when Manço left Sayan for the Yavuz Plak imprint. Though this single is missing Moğollar keyboardist Murat Ses' trademark Hammond organ, guitarist Cahit Berkay's mournful refrain and drummer Engin Yorukoglu's thunderous groove mark Moğollar's influence on this, the highlight of the so-called "Manchomongol" period of Manço's career. Dünden Bugüne is available from Guerssen Records. In February 2007, I was standing in the back of the Stones Throw offices, chatting with rapper Guilty Simpson and producer Denaun Porter, when our office manager handed me a package: "It's from Istanbul, and it's heavy," he said with a smile. "Can't wait to hear 'em!" I pulled Denaun to the front of the room, tearing open the package as I walked, and settled by the front turntable, where I played this "Manço Prodüksiyon." Out poured a deep organ riff reminiscent of Led Zeppelin's "Whole Lotta Love." It persisted for what seemed like minutes before bellowing drums, percussive violins and a furled bass line paved the way for the Sevil and Ayla's choral cooing. (Manço, realizing the power of this groove, later reprised "Bebek" for "Lonely Man" from Nick the Chopper, his only English-language album.) "Damn!" preceded Denaun's inevitable question: "How can I get some of that?" Of course, I sent him the obligatory CDR. I now wait patiently as Denaun — executive producer of the upcoming Detox -- finds a way to sneak some Manço onto Dr. Dre's long-awaited album. 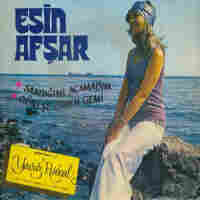 This is one of Manço's first singles to feature the initial incarnation of the Kurtalan Ekspres: Ozkan Ugur, Ohannes Kemer, Nur Moray and Celal Guven. They're joined on this single by Moğollar drummer Yorukoglu and keyboardist Ses on an ever-present Moog synthesizer. The results are outstanding and owe a stylistic debt to saz virtuoso and, in this track, composer Neşet Ertaş. Manço later included this single on his Yavuz Plak compilation album Sakla Samani Gelir Zamani, where it competes with an equally superb single, "Olum Allahin Emri," for top billing on an album full of fine moments. It is a testament to Manço's growing star power that singer, songwriter and actress Esin Afşar entrusted him to helm her "Sandığımı Açamadım" single. Only one entry separates "Gonul Dagi" and "Sandığımı Açamadım" in the Yavuz Plak discography, and the Manço/Kurtalan Ekspres influence is clear: Heavy drums and staccato, low-register bass lines periodically give way to the strings and woodwinds that embellish Afşar's vocals. Axelrod had his Songs of Innocence. Gainsbourg had his Histoire de Melody Nelson. Manço had his 2023. It's just as likely that Manço never encountered the Capitol Records producer's debut as it is that he was aware of the Frenchman's masterpiece. But the drive to create a singular statement spread out over both sides of a long-player lead to Manço's first and most unified album for Yavuz Plak. Hindsight with global vision might have shown Manço that commercial failure was almost preordained, but we should be glad that he — backed by an expanded Kurtalan Ekspres and armed with a drum machine, Korg synthesizer and double-necked guitar — powered through this dark, futuristic album. The final song on 2023, "Kol Basti!" took Turkish progressive rock to its zenith.